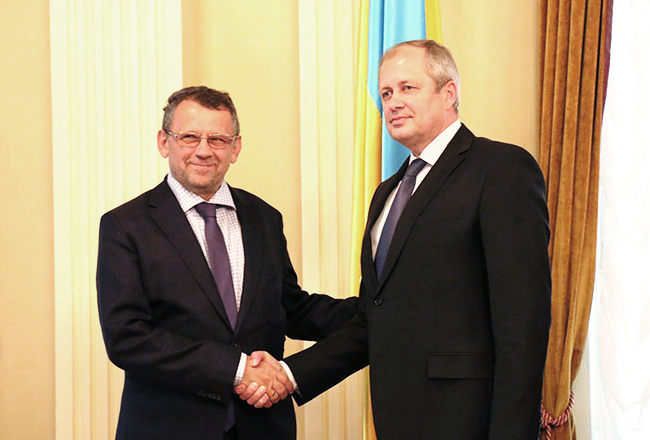 On January 13th Kálmán Mizsei, the Head of the European Advisory Mission to Ukraine, met with Mr. Yaroslav Romaniuk, President of the Supreme Court. Since this was the first official meeting between the mission and a high representative of the Ukrainian judiciary, one of the main topics was the mandate of the mission in the field of judiciary. “We exchanged our views on the mandate, but we also have discussed the planned reforms as stated in the strategy for the Judiciary drafted and by the Judicial Reform Council of the President and the implications this strategy will have for judges, courts and the people of UA”, said Mizsei. One of the reform main issues is to increase the independence of judges and to have more transparency during their selection, appointment and dismissal. EUAM offered support and advice to the implementation of these plans since the Judiciary is mentioned as one of the key reform objects for UA.